Is 100 the new 50? Have we found the secret to living longer? Maybe not, but life expectancy is on the rise. 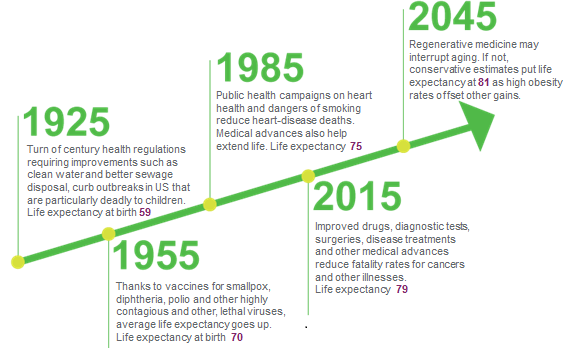 In less than a century, more years were added to life expectancy than all years added across all prior millennia of evolution combined. * Today, there are an estimated 35 million Americans age 65 and older, and over the next 25 years that number is expected to rise to 80 million Americans. So why are individuals living longer and what can we do to ensure a long, healthy lifestyle? Immunizations – According to the CDC, dramatic declines in morbidity have been reported for the nine vaccine-preventable diseases. These vaccines were universally recommended for use in children prior to 1990. They include: smallpox, polio, measles, influenza type b, diphtheria, pertussis, tetanus, mumps, and rubella. Control of infectious diseases – Improvements in sanitation and hygiene, along with the discovery of antibiotics, have helped control infectious diseases in the 20th century. Reduction in heart disease and stroke – While many factors have contributed to the decline in heart disease and strokes, some of the most noteworthy trends include a decline in cigarette smoking, decrease in mean blood pressure levels and blood cholesterol levels and improvements in medical care. Here are some ways you can add on the years and live a healthier, longer life. Refrain from smoking – Smoking can cause damage to your eyes, speed up the aging process of your skin, and impact the health of your lungs. Exercise – By exercising regularly, your bones stay strong, your lung function declines slower and you retain your muscle – slowing the process of muscle loss turning into fat. Wear sunscreen/sunglasses – Protect your eyes and skin by wearing sunglasses and sunscreen when you are out in the sun. Drink water – Drinking plenty of water is one of the most important things you can do for your body. It supports kidney and digestive function and helps keep your skin healthy. It’s time we start taking better care of our health so we can see today’s generation tomorrow. Can you imagine what it would look like if 100 was the new 50?